- A new way to fund nongame work nationwide. 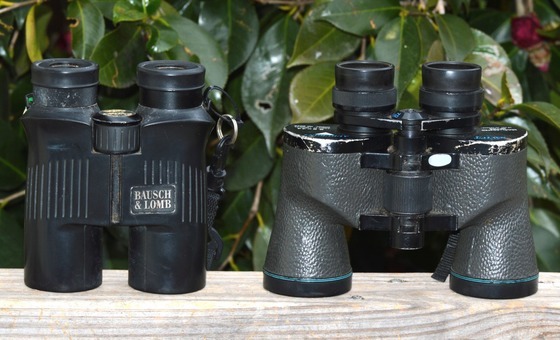 - Choosing the right binoculars for you. - Why Georgians are key to conserving wildlife. A group of energy, business and conservation leaders said last week the best way to meet America’s growing endangered species problem is to redirect $1.3 billion a year from energy and mineral development on federal lands and waters to state-based wildlife conservation. 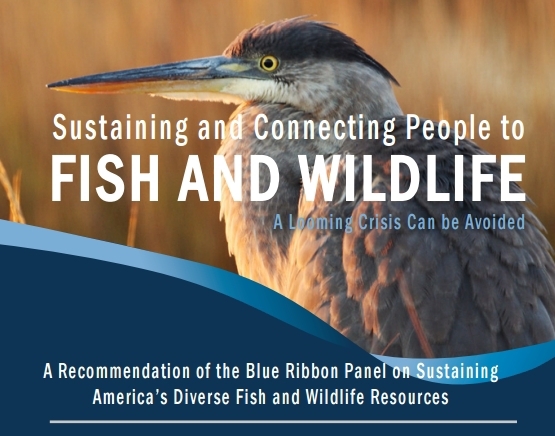 The recommendation from the Blue Ribbon Panel on Sustaining America’s Diverse Fish & Wildlife Resources answers what its report calls a “looming crisis:” the addition of possibly thousands of species under the federal Endangered Species Act. Nearly 1,600 are listed as threatened or endangered. Formed in 2014 by the Association of Fish & Wildlife Agencies, the panel includes leaders varying from outdoor businesses to energy industries, sportsmen’s groups and universities. Members explored funding, policy options and nongame wildlife needs. “Thousands of species of birds, mammals, fish, frogs, turtles and insects have been slipping through the cracks for decades,” says the report released. Federal funding for states to conserve wildlife not fished for or hunted mostly comes from State and Tribal Wildlife Grants, budgeted at $50 million to $60 million and regularly targeted for cuts. Georgia received $1.21 million last year. - Providing needed funds for state fish and wildlife agencies to conserve some 12,000 high-priority species, as identified in State Wildlife Action Plans. - Sustaining the country's natural infrastructure, which enriches humans in ways including pollination, water purification, recreation and food production. - Supporting the U.S. economy – fish and wildlife populations are key to a $646 billion outdoor recreation economy and 6.1 million jobs – and citizens' quality of life, strengthening the conservation and outreach needed to keep people connected with nature. Below: Public is key in conserving Georgia wildlife. Beyond a shadow of a doubt, the one piece of equipment that can have the greatest impact on your enjoyment of your backyard neighbors is a fine pair of binoculars. Since all binoculars look pretty much the same, it’s easy to assume they all perform in a similar manner. But I learned years ago that’s not the case. Then, I was using binoculars I bought for something like $29.95. I took them hunting, wildlife watching, on vacations. As far as I was concerned, the images I saw through them were as sharp as I could expect. When I looked through his well-crafted binoculars, I exclaimed, “I can’t believe it!” The birds appeared brighter, more clear and three-dimensional. Read the rest of Terry's column to guide your binoc search! Terry W. Johnson is a former Nongame program manager with the Wildlife Resources Division and executive director of TERN, the Nongame Conservation Section’s friends group. “Out my backdoor” library. You may know that Georgia DNR’s Nongame Conservation Section is charged with conserving the state's nongame wildlife. That includes endangered and other native animals not legally fished for or hunted, rare plants and natural habitats. But what you may not know is this work is paid for mostly through grants, fundraisers and direct donations. Contributions go into the Georgia Nongame Wildlife Conservation Fund, created by state law to conserve nongame and habitats. 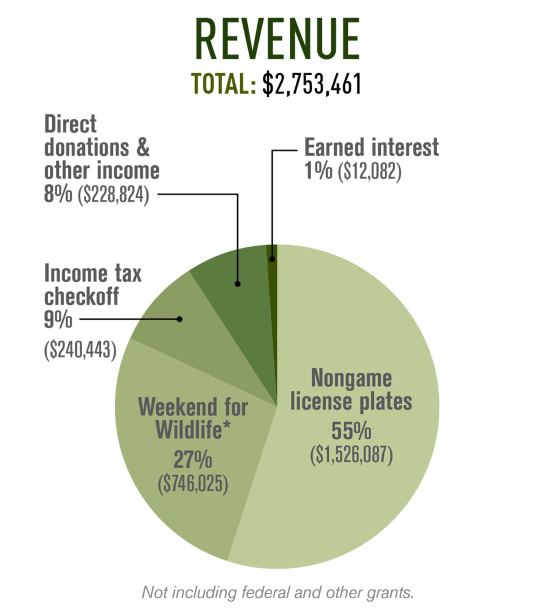 The pie chart below shows Nongame Wildlife Fund revenue sources in fiscal 2015. Clearly, sales and renewals of eagle and hummingbird license plates are vital. So is what’s called the Give Wildlife a Chance state income tax checkoff. And while Nongame Conservation received some state funds in fiscal year 2016, a first in decades, the funds make up less than 5 percent of the agency’s budget for wildlife conservation programs. How can you help restore and protect populations of wildlife such as bald eagles and gopher tortoises, rare plants like monkeyface orchids and critical habitats such as longleaf pine savannas? - Upgrade to an eagle or hummingbird license plate, only $25 more than a standard tag. - Donate through the Wildlife Conservation Fund checkoff when filing your 2015 taxes. - Learn more about what Nongame Conservation does and how you can help support this work. 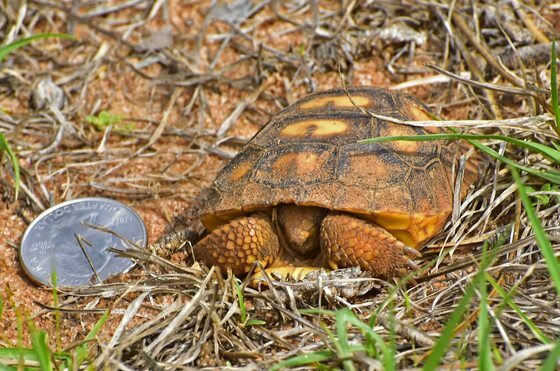 Also, as noted above in this issue's lead article about the Blue Ribbon panel, the need for broader funding to conserve nongame species isn’t just a challenge for Georgia. Conserving wildlife and their habitats enriches our quality of life, helps keep our waters clean and forests healthy, and strengthens our economy – now and for the next generations of Georgians. Learn more in Nongame Conservation's annual report. A $2,500 reward is offered for information leading to a conviction in the shooting of a mature bald eagle found dead in northwest Georgia’s Polk County last month. Anyone with information can call U.S. Fish and Wildlife Service Special Agent Brian Roland, (404) 763-7959, or the Georgia DNR Ranger Hotline, (800) 241-4113. Young birders have until only March 31 to sign up for DNR’s 2016 Youth Birding Competition. Set for 5 p.m. April 22 through 5 p.m. April 23, the free birdathon will have kindergarteners through high school seniors scrambling statewide to identify the most bird species and report them at Charlie Elliott Wildlife Center before the event-ending banquet. Florida’s manatee population – the source of manatees that move into Georgia in spring and summer – is going strong, according to annual aerial surveys. The Florida Fish and Wildlife Conservation Commission reported a preliminary count of 6,250 manatees statewide and 3,292 on the east coast, similar to last year’s state total of 6,063 and only the second year on record the count of these endangered mammals has topped 6,000. Photos. Rattlers or wild chickens? Visitors can find both plus plenty of entertainment and education in these soon-coming events – the Rattlesnake and Wildlife Festival March 12-13 near Claxton and Fitzgerald’s Wild Chicken Festival March 18-19. Both south Georgia festivals have transitioned and grown after abandoning rattlesnake roundup formats that included wild-caught rattlers. The great-horned owl nest at The Landings community on Skidaway Island has two owlets! 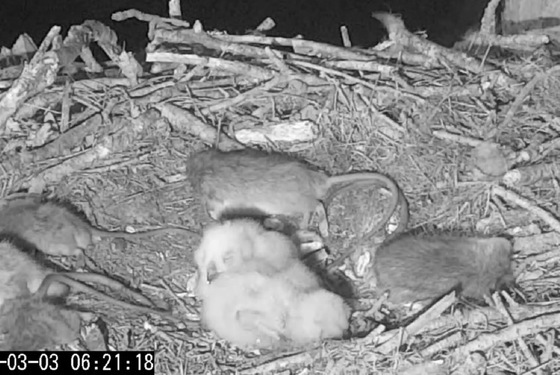 And considering the screen grab above, the owlets (in the center) don't appear in immediate danger of starving. Watch 24/7 via The Landings, www.georgiawildlife.com and the Cornell Lab of Ornithology. Wild plant enthusiasts will explore south Georgia’s diverse native flora during the Georgia Botanical Society’s annual Spring Wildflower Pilgrimage, April 15-17 in Valdosta. The 47th annual pilgrimage will include field trips to places such as Decatur County limestone cave and the Valdosta State University herbarium’s field station at a blackwater lake. Wondering why leading young whooping cranes on migration with ultra-light aircraft has ended? In this FAQ, the Whooping Crane Eastern Partnership answers that and other questions about efforts to save the endangered birds. New this turkey season, Georgia hunters will have to obtain a free harvest record each season, fill out the date and county before moving a gobbler they’ve killed, and complete the reporting process through Georgia Game Check within 72 hours of bagging the bird. Learn more and download the helpful Georgia Outdoors app. Names: DNR fisheries technician II David Tannehill has been named Fishery Worker of the Year by the Georgia Chapter of the American Fisheries Society. Tannehill, based at the Fort Valley office, “is a model team player, always bringing his best to whatever task he sets out to do,” said Steve Schleiger, fisheries region supervisor. Wildlife Resources Division leaders, including Assistant Director Mark Whitney and Nongame Conservation Section Chief Dr. Jon Ambrose, met with lawmakers and their staff in D.C. this week to discuss funding for nongame conservation, all part of the annual Teaming With Wildlife Fly-in. 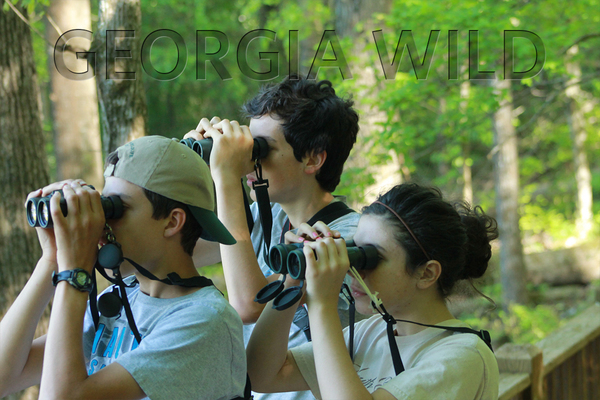 April 22-23 – Georgia Youth Birding Competition. Finish and banquet at Charlie Elliott Wildlife Center, Mansfield. - Another golden eagle tracked in Georgia. - Searching for spotted turtles. "Reward offered for information in killing of bald eagle in Polk County," WMGT-TV (NBC 41, Macon) and others, including Atlanta Journal-Constitution. Georgia Wild© is a free newsletter focused on nongame wildlife – animals not legally fished for or hunted, plus Georgia’s native plants and natural habitats. DNR Wildlife Resources Division Nongame Conservation Section. All rights reserved. Nongame annual report.